← A Book from a Machine? Contra dancers at the Champlain Valley Folk Festival in 2006. If these phrases are familiar to you, chances are you’ve been to a contra dance sometime in your life. With some of the same steps as square dancing, contra dancing is done all over the U.S. to mostly traditional folk music (fiddle, guitar, keyboard, accordion). It grew out of English country dancing and the French quadrille, but is primarily an American style of dance and has strong roots in New England. After I started attending contra dances, I learned that my grandmother went to contra dances at the grange hall in northern New Hampshire in the 1920s. Couples line up in long lines down the hall, and over the course of the dance you will have danced with most of the other couples in the line. A “caller” teaches the dances, calling out the dance moves at first slowly without any music, and then with the band playing along. Once the dance is going smoothly, the caller typically drops out and lets you just enjoy the dancing. In addition to being great exercise, contra dancing is a great community-building experience. Just about anyone can do it – I’ve seen little kids and grandparents, young parents with a baby in a backpack, and all ability levels. 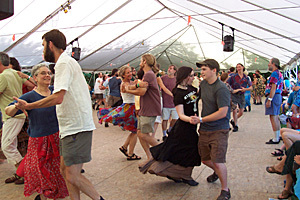 (Click here for a more detailed description of contra dancing and some dancing tips). Contra dancing is also a great example of synchronicity between music and dance. The music is in fact an essential part of the experience – by listening to the music you know when to go into the next move, often on a down beat. And sometimes you’ll hear a particular part of the tune, or a rhythmic pattern, and that will cue you that it’s time to do a certain step. One of the most memorable dances I ever attended had us dancing to “Hoedown” from Aaron Copland’s Rodeo. Not the easiest thing to do since it had an odd time signature, but the musicians made it work with the dance pattern. Once you’ve been dancing for a while, you can appreciate the pattern and flow of the dances. And the little extra bit of pressure from your partner’s hand (which I’ve heard called “giving weight”) helps you transition through the steps. It’s especially helpful when you forget what the next move is! Other dancers are generally good about getting you back to the right place if you get lost though. 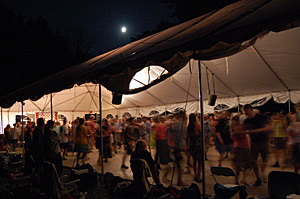 Moon over the dance tent at the Champlain Valley Folk Festival, 2009. And sometimes, once the music gets going and the caller stops calling, it can be a transcendent experience, taking you out of time and place. And if you are very lucky, you have had a chance to dance outdoors at a folk festival on a summer evening with a moon above, a springy wooden dance floor under your feet, and a breeze blowing in off the lake. Magical! There are contra dances here in Rochester every Thursday night. Click here for more information. This entry was posted in Synchronicity: Musings on Words, Music, and the Arts, Uncategorized and tagged Champlain Valley Festival, contra dance, folk music, New England, tradition. Bookmark the permalink.